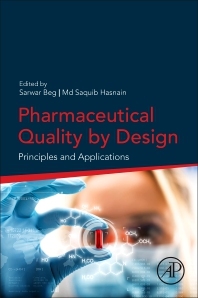 Pharmaceutical Quality by Design: Principles and Applications discusses the Quality by Design (QbD) concept implemented by regulatory agencies to ensure the development of a consistent and high-quality pharmaceutical product that safely provides the maximum therapeutic benefit to patients. The book walks readers through the QbD framework by covering the fundamental principles of QbD, the current regulatory requirements, and the applications of QbD at various stages of pharmaceutical product development, including drug substance and excipient development, analytical development, formulation development, dissolution testing, manufacturing, stability studies, bioequivalence testing, risk and assessment, and clinical trials. Contributions from global leaders in QbD provide specific insight in its application in a diversity of pharmaceutical products, including nanopharmaceuticals, biopharmaceuticals, and vaccines. The inclusion of illustrations, practical examples, and case studies makes this book a useful reference guide to pharmaceutical scientists and researchers who are engaged in the formulation of various delivery systems and the analysis of pharmaceutical product development and drug manufacturing process. Dr. Sarwar Beg is currently serving as Assistant Professor at Department of Pharmaceutics, School of Pharmaceutical Education and Research, Jamia Hamdard, New Delhi, India. Prior to joining Jamia Hamdard, Dr. Sarwar was worked with Jubilant Generics Limited, Noida, as Research Scientist and was responsible for QbD implementation in formulation and analytical development of generic products. He has over a decade of experience in the field of pharmaceutics, especially in the systematic development and characterization of novel and nanostructured drug delivery systems employing Quality by Design (QbD), Design of Experiments (DoE) and multivariate statistical approaches. Besides, Dr. Sarwar has good knowledge in applying various other advanced computational tools like drug release kinetic modeling, pharmacokinetic modeling and in vitro/in vivo correlation (IVIVC) approaches for efficient development of drug products. Till date, he has authored over 125 publications in various peer-reviewed journals, 35 book chapters, 7 books and 3 Indian Patent applications to his credit. Overall, he has earned highly impressive published and cited record with H-Index of 21 and over 2000 citations to his credit. Dr. Beg has participated and presented his research work at several conferences in USA, Canada, China, India, Bangladesh, and has earned several “Best Paper” awards. He has also been awarded with “Innovative Pharma Research Award 2016” by SIPRA Lab (Hyderabad), “Eudragit® Award 2014” in South-Asia by M/s Evonik GmbH (Germany), “Budding QbD Scientist Award 2014” and “Budding ADME Scientist Award 2013” by M/s Select Biosciences (UK) and “Novartis Biotechnology Leadership Award 2012” (Hyderabad). In April 2017, Dr. Sarwar was felicitated by Hon’ble Union Health Minister of India, and Managing Director, Sun Pharma, with prestigious “Sun Pharma Science Foundation - Young Scientist Award”. Dr. Md Saquib Hasnain has over 6 years of research experience in the field of drug delivery and pharmaceutical formulation and analyses; especially systematic development and characterization of diverse nanostructured drug delivery systems, controlled release drug delivery systems, bioenhanced drug delivery systems, polymeric composites, nanomaterials and nanocomposites employing Quality by Design approaches. Till date he has authored over 30 publications in various high impact peer-reviewed journals, around 30 book chapters, 1 Indian patent application and 4 books to his credit. He is also serving as the reviewer of several prestigious journals. He is also serving as the associate editorial board member of Recent Patent on Drug Delivery & Formulation journal. Overall, he has earned highly impressive publishing and cited record in Google Scholar (H-Index: 12). He has also participated and presented his research work at over ten conferences in India, and abroad. He is also the member of scientific societies, i.e., Royal Society of Chemistry, Great Britain, International Association of Environmental and Analytical Chemistry, Switzerland and Swiss Chemical Society, Switzerland. I have gone through all the Chapters of this book. All the Chapters are very much intersting and illustarate in depth concept and applications of QbD in Pharmaceuticals Product Development. Definitely it is helpful for thereaders, analyst or researchers for complete understanding the subject knowledge and immplementing QbD in their research areas. This book has covered the basic to advanced concept and application of quality by design in pharmaceutical product development. Additionally, this book has described the QBD application in nanotechnology based product development also. I found this is an excellent book for current research perspective. I am sure this book will help the reader to understand the qbd with its relevant implementation in their research work.